To be the absolute preferred Design and Construction Company of Commercial interiors in Victoria. Develop a highly skilled, innovative and harmonious team focussed on producing design and construct outcomes which exceed our clients specifications. To be the absolute best place to work in our industry for staff and stakeholder. It may not come as a complete surprise but the work we do in our office week out and week in is far more productive if the work takes place in a well designed office. A well designed office signals the values and objectives of the company and use of design in office interiors communicates a company’s values and identity. So why is it that so many companies still stuck with boring, unattractive and ultimately unproductive office designs? In most cases as always it comes down to two factors, office design cost both money and time. But these are short sighted costs. Good workplace design can make a big difference in staff satisfaction, attraction, motivation and retention. 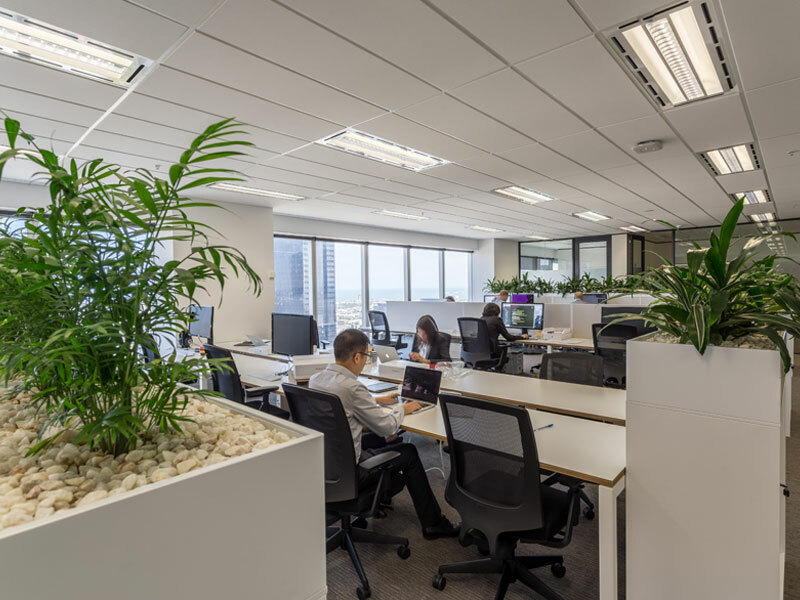 A study by the commission for Architecture and the Built environment and British Council for offices has found even simple things such as good lighting and having adequate daylight can reduce absenteeism by 15 percent and increase productivity by between 2.8 and 20 percent. The average office space used to be 70% cubicles and 50% collaborative or shared space. Today that equation is 55% cubicles and 45% shared space. In the agile office, a hybrid solution often works best: small private rooms for concentrated work. Concept Office Interior designs are pragmatic with a sharp focus on function and form as well as being highly mindful of costs. Each project is carefully considered, planned and designed. From the initial concept, we work with our clients until the very end when they tell us that they are completely satisfied. We monitor every step of the plan, the design, the move, and even after the business has settled into its new office space. We are only happy when our customers tell us they are. Moving office or creating a new office space is a challenging time that requires an adaptable, flexible and resourceful team. Our multi-talented team provides all-round expertise to address the challenges that arise and build relationships with a diverse range of clients and their needs. We maximise the resources of our dedicated team to develop a plan that will suit your cost plan budget. Our consultants ensure that you are creating the office space that your company, brand and team need. We document all requirements carefully for your approval and our project managers make sure that it is delivered on time and to specification. We design what you need for your business now and in the future. We create effective solutions for workplaces and living areas through inspiring and creative designs. A well designed office space provides an efficient and comfortable place to work in and gives as an expression of your company’s brand and values. The way a company operates can be reflected in the physical needs of their building, meeting rooms, office space, equipment and facilities. The business purpose, the people who do it, how old they are, how they communicate, live and think can also impact on the environment. Concept Office Designs take all of this into consideration to provide you with a functional, pragmatic and efficient space. We work with you to assess your current environment and potential new office spots. We determine whether your existing space can be adapted. We work with your stated cost and time requirements and develop solutions to increase productivity or other stated business goals. We don’t just make an office look pretty, we develop the space to meet your current and future business needs. Our methodical and creative project team manage every single step to make sure your new office is a success on the day you need it to be and to the cost and specification you demand. There’s no surprise party. From the outset we carefully construct estimates, timeframes and plans that are meticulously managed. We live and breathe office design and managing projects like this comes easily to us. This phase of the project is made simple at Concept Office Designs due to our experience and qualified trades people. Where other businesses worry about the plumbing, heating, electricity, walls, ceilings and floors; we just see it as the phase of the project where all of our hard work and effort takes effect. We manage our own trades who have worked with us for many years. This helps us to be cost effective because there isn’t too much rework when you hire good quality people. Defects are picked up during the project, not just presented at the end of the fit out. Victorian Branch of the Design Institute of Australia.